Buying Or Refinancing A Home – Prepares you for the complex decisions you will have to make when deciding to buy a new home or refinance an existing home. Selling A Home – Outlines marketing strategies to help you close the deal on your existing home. 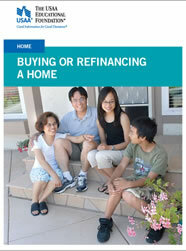 Renting A Home – Guides you through the process of choosing the right rental property. USAA Educational Foundation is a non-profit organization, providing Good Information for Good Decisions. What’s My Home Worth? – From http://www.Zillow.com: an online real estate service dedicated to helping you get an edge in real estate by providing you with valuable tools and information. Compare Mortgage Rates – From Bankrate.com: the web’s leading aggregator of financial rate information. Automated Housing Referral Network (AHRN) – (www.ahrn.com) a FREE, self-service web site to assist service members make more informed living decisions. They can search for available housing around Ellsworth (or their new base) that suits their needs, post a rental, sell a home or advertise for roommates.